A few lucky guests each week follow along (or rather, try to keep up!) with Judy Witts Francini, aka Divina Cucina. A bundle of energy, each morning armed with an empty basket and a head full of menu ideas, she takes the Central Market in Florence by storm. 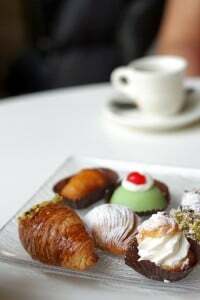 A day begins with espresso at her favorite pastry shop, Antica Pasticceria Sieni (via San Antonio) where you sip espresso served with spicy wedges of panpepato, crisp brutti ma buoni (which means “ugly, but good”), and delicate cream-filled pastries. Soon after, you’re exploring the market with Judy. I tasted well-aged balsamic vinegar, found delicate tiny wild strawberries, and sampled aged sheep-milk Pecorino cheeses…which could make even the most devoted, cheese-loving Francophile pack their bags for Tuscany. After thoughtfully selecting wines for lunch from her local expert at Casa del Vino (via dell’Ariento, 16/r), the sandwich maker fixed me a surprise snack for my train trip that evening. When I unwrapped my sandwich, I found Tuscan bread stuffed with anchovy and olive oil marinated tomatoes, arugola, and creamy burrata cheese from Apulia. 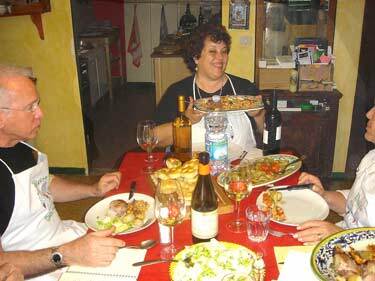 Then we walked back to Judy’s apartment and participated in some hands-on cooking demonstrations. 1. Don’t listen to music or watch tv while cooking, which distracts you from the food as it crackles, sizzles, and simmers. 2. Used good olive oil. The best olive oils are pressed from hand-picked olives. Lesser-quality olive oils use olives that fall from the tree, which causes them to bruise and become prone to rancidity. That’s why cheaper olive oils turn bad after a few months while better oils last much longer. And tastes better! 3. Always heat olive oil first in your saute pan before adding meat or vegetables. This allows food to sear and cook quickly, which augments flavors. An exception is fresh garlic, which should be heated at the same time as the oil, since it’s easy to burn. 4. Techniques are more important than recipes or details. Even if you’re not a master chef like Judy, use recipes as guidelines for cooking. While a recipe may indicate a cooking time of 20 minutes, you may find it takes more or less time in your kitchen. And you may like more salt. Or your lemons are larger, and sweeter. Learning techniques, rather than just following recipes, will make you cook like an Italian. 5. Almost all true balsamic vinegars are aged for at least 10 years. Anything less is not a real balsamic. The stuff you buy in shops labeled ‘balsamic’ with the consistency of water is not true balsamic and has added colorings and flavorings. Once you taste the real thing, you’re eyes will roll back in your head and you will hallucinate. I’ve been cooking professionally for over half of my life and I’ve tasted some mighty fine food, but one of the best things I’ve ever had, she made right in front of us: Herb Garlic Rub. It’s something that anyone can make and tastes infinitely better than those stale mixtures one buys in a jar. Judy shucked a few large branches of fresh rosemary leaves. She added the leaves from an enormous bunch of fresh sage, a generous handful of salt, and 4-5 cloves of fresh garlic. Then she chopped and chopped and chopped until very fine, then left the mxiture on the cutting board until dry, which takes a day or two. Once dry, store the mixture in a jar. You can use the Herb Garlic Rub on any meat, fish, poultry, or vegetable. Add a bit to a bowl of good olive oil for dipping bread. Then in an amazing feat of culinary skill, replicating something that intrigued me at the market, Judy split a long loaf of Italian bread lengthwise. She generously poured some good olive oil over the insides (without measuring, folks…), dusted it with Herb Garlic Rub, then tucked a pork tenderloin inside. After wrapping the whole thing in foil, she baked it directly on the oven rack (in a 375 degree oven for about one hour.) As she unwrapped it, the overwhelming aroma of herbs and garlic permeated the air. None of us could be polite any longer, and we begin ripping off hunks of the herb-and-olive-oil infused bread and stuffing them in our mouths. For dessert Judy whipped up Panna Cotta, one of Italy’s most beloved desserts. 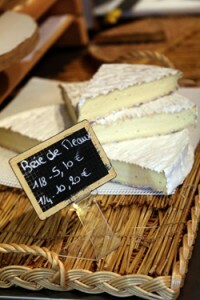 Although Judy uses local Tuscan cream, you can substitute whole milk or buttermilk for some of the cream. We tossed tiny wild strawberries and plump raspberries in sugar to macerate, then piled some atop each Panna Cotta and drizzled it with an unrestrained pour of 30 year old syrupy-sweet balsamic vinegar. Soften gelatin over 6 tablespoons cold water. Heat cream over low heat with the sugar and stir until dissolved. Do not boil. Remove from heat. Stir in gelatin until melted. Add the vanilla. Pour into glass serving goblets or bowls. Chill for at least 2 hours. 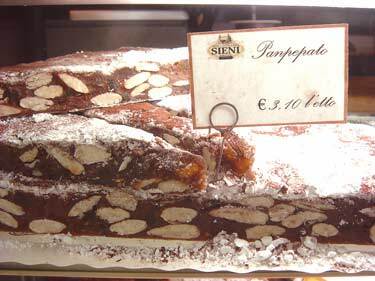 Once firm, top with sweetened berries and aged balsamic vinegar, or lots of shavings of chocolate. 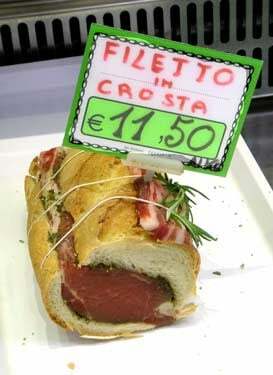 Apropos the “filetto in crosta”, Clarissa Dickson-Wright (one of the “Two Fat Ladies” – see page 164 of the cook book of that name) has the “Shooter’s Sandwich.” This is a seasoned grilled rump steak cooked rare, with field mushrooms, inserted into a hollowed-out sandwich loaf of finest quality. The end crust of the loaf is then replaced and the whole “sandwich” is wrapped in blotting paper and then greaseproof paper (or just cooking foil), tied with string into a neat parcel and then pressed under a weighted board for at least 6 hours. 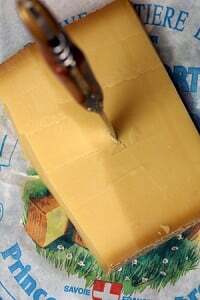 The “sandwich” can then be sliced for eating as required and is ideal for long (several days! )railway journeys “…accompanied by a flask of whiskey waters.” The original recipe was from T. Earle Welby’s book, published in 1932 by Methuen, “The Dinner Knell”.